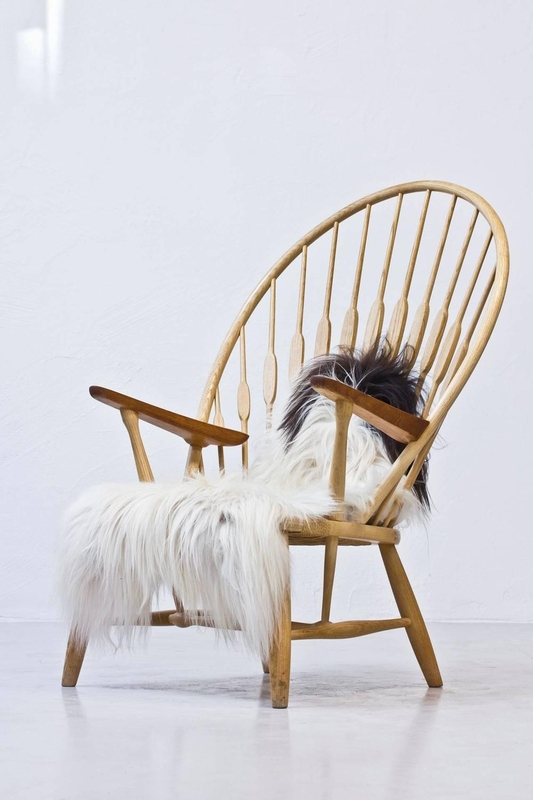 The PP550 Chair, commonly known as the Peacock Chair, is perhaps one of the lesser-known designs of Hans J. Wegner. Nevertheless, owing at least in part to its unusual and elegant appearance, the chair has earned a very special place in the history of interior design. Nicknamed ‘The Master of the Chair’, Hans J. Wegner designed the Oculus Chair. It was his great passion for the design of chairs that eventually made Wegner a legendary figure in Danish Modernism and world-famous furniture designer. He created more than 500 chairs, many of which went into mass production. The prototype of the Peacock Chair was introduced in 1947 and shortly after it was launched into production by the Johannes Hansen’s Møbelsnedkeri A/S furniture company. Unfortunately, its production did not last long and soon after the chair shared the fate of many of Wegner’s designs, including the Shell Chair and the Elbow Chair. For almost half a century, the chair remained forgotten before winning enough attention and becoming commercially available again. The Peacock Chair was brought back to life by the PP Møbler furniture company in 1992. This furniture design classic, produced under the new brand, enjoyed instant commercial success thus finally fulfilling Wegner’s core belief; that a chair is only finished when somebody actually sits in it. The form of the chair is rather ascetic, yet sophisticated and unusual. Its design embodies its creator’s famous credo, which claims that: “A chair should have no rear view. It should be beautiful from all sides and angles." Indeed, the chair with its famous curves looks very appealing and elegant under any angle. A light, attractive and comfortable lounge chair, which feels as modern today as it did more than half a century ago. An excellent example of Wegner’s constant striving towards organic simplicity to create sculptural beauty, comfort and outstanding stability. The Peacock Chair is yet another proof that Hans J. Wegner was way ahead of his time when it comes to the wooden furniture design. The chair’s minimalistic and straightforward appearance may mislead into thinking that it is relatively easy to make, which is very far from truth. Due to the utilization of steam-bent solid wood components, the chair demands a perfect craftsmanship and a thorough understanding of wood joinery. Hans J. Wegner drew inspiration for his design from the British Windsor Chair. However, Wegner’s version has shorter legs and more generous back rest, which is leant slightly backwards, hinting at its comfortable, relaxing lounge feel. The backrest consists of the steam-bent arch and spindles, which are flattened in the approximate area of a person's shoulder blades. The back rest gives the chair its exotic appeal and evokes a birds tail plumage. Hence the chair’s name – “The Peacock Chair”. The high level of comfort can be attributed to its hand-woven seating pan, which is made of paper cord. The pattern in which the seat is woven resembles the Wishbone Chair’s seat. The chair is supported on four short dowel legs, which are spanned together for the additional strength. An extremely low center of gravity makes the chair very stable and balanced. The PP550 is made from ash and is available in either soap, oil or lacquer finish. If customers find the one-colour schema too monotonic, they can order the chair’s sloping arm rests to be manufactured from much darker teak wood. Although the chair looks like a masterpiece of modern art, it is fully functional and very comfortable. This timeless piece of furniture still looks extravagant and intriguing, making it a great, tasteful addition to any modern interior. When Finn Juhl, a famous Danish architect, interior and industrial designer, first saw the PP 550 chair he immediately noticed its characteristic back and named it The Peacock Chair - a name which stuck with the chair. The Peacock Chair’s complicated manufacturing process adds to the price of this unique piece of furniture. The cost of the single PP550 Chair oscillates around astronomical £5000.